Together, through God’s grace, we are making a difference! Over 20 years ago, a partnership was formed between Pastor Leon Dorleans in Cite Soleil, one of the poorest communities in Haiti, and a group of folks from Fairmont Christian Church in Mechanicsville, Va. In 1991 Haiti Outreach Ministries (HOM) was incorporated as a non-profit corporation to help make gifts to the Cité Soleil church tax deductible. For many years teams traveling to Haiti were met at the airport by Pastor Leon in his pickup and worked on projects under his direction. HOM leadership in America helped to support his ministry by fund raising and equipping teams to go to Haiti. After the 2010 earthquake, funds and the number of team increased exponentially. 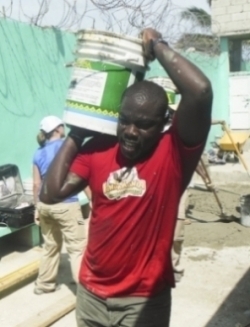 HOM leaders, Leon and other Haitian church leaders quickly developed strategies to house, transport, and coordinate the efforts of volunteers among the chaos of the post-earthquake era. 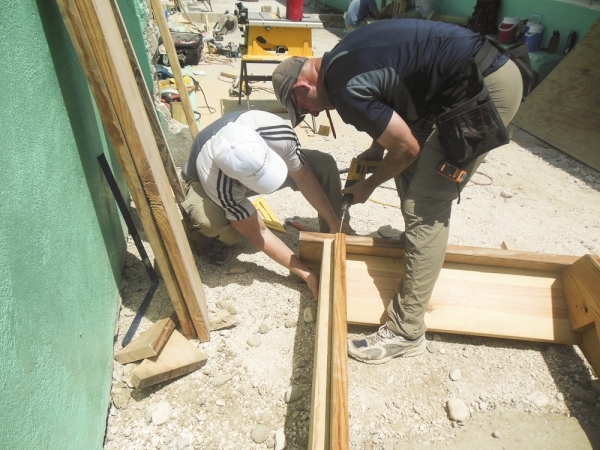 HOM recruited North American staff to live and serve in Haiti while board members assumed greater responsibilities. Leon and other key leaders in the Mission Communautaire de l’Eglise Chretienne des Cites (MICECC)* worked to determine how best to minister to the people of their communities. 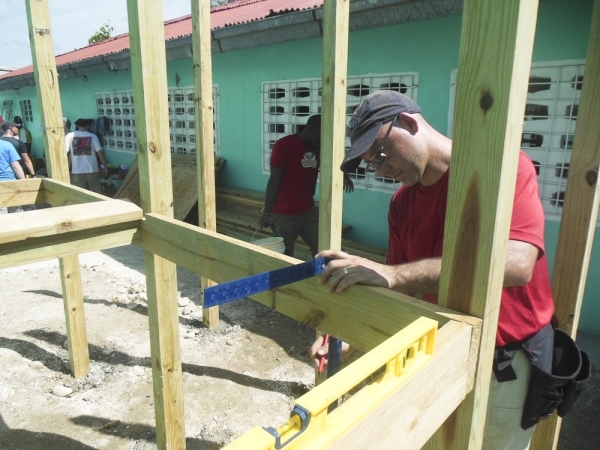 Although HOM has always served under the guidance and leadership of MICECC, in the aftermath of the earthquake, HOM leaders and staff became the primary contact for teams and a more visible presence in Haiti. Many volunteers were not aware that HOM’s primary purpose is to support the work of MICECC. 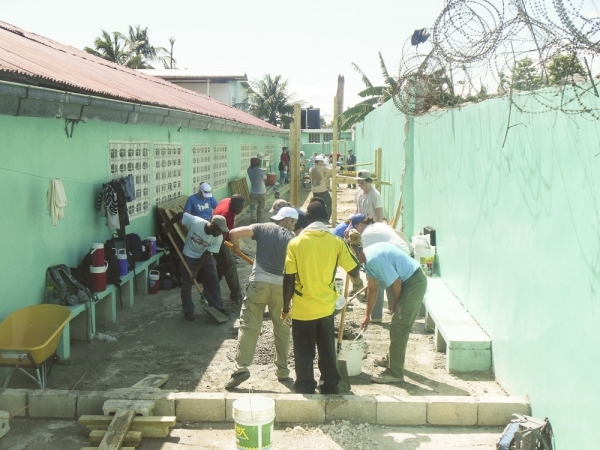 In mid-2013 HOM and MICECC leaders decided it was time to decrease the presence of North American volunteers in Haiti and revert to a primarily Haitian run operation. Strategies that were appropriate in the immediate post- earthquake era are no longer necessary and our plans now focus on the current and future needs of the Haitian people. 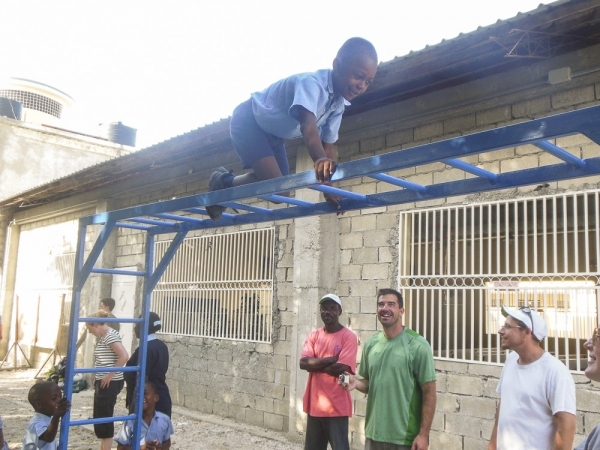 We also want people to recognize that this is first and foremost a Haitian Mission. Although HOM plays a key role, it is through the leadership of Leon and MICECC, and God’s grace, that we are able to meet the spiritual and physical needs of the Haitian people. Our new logo reflects that we are a Christian organization; recently it was revised to emphasize that together we are doing God’s work in Haiti. HOM is immensely grateful for the opportunity to partner with our Haitian leaders in MICECC and to the countless volunteers over the years who have not only gone to Haiti, but those who have prayed, donated their time and money, and volunteered in so many ways. We know that God has great plans for us, it is our hope you will continue to be a part of His work in Haiti through HOM and MICECC. Back on March 1, 2013 we brought to the attention of our Haiti Outreach Ministries (HOM) supporters the transportation needs for Pastor Luc Aristhene and Pastor Profaite Medeus. We are very pleased to report that through the generosity of many supporters Pastor Profaite was provided with funds to purchase a new diesel Toyota pickup truck in August. The efforts for Pastor Luc have been encouraging but at this time funding is still about $23,000 short of the goal. Several other associate pastors will also need transportation as their responsibilities have increased and HOM hopes to assist with the purchase of used cars for them. Each ministry has its own challenges pertaining to its church context and model of ministry. In Haiti, one the key issues that church leaders have to deal with is reliable transportation. In fact, Haiti is a country that copes with a lack of infrastructure. Most roads are bumpy and unpaved which often causes lots of traffic and delays. However, Haitian ministers have several obligations such as church services, meetings, visiting people and assisting people in many ways, including transporting them at times. All these activities require them on a daily basis to drive from one place to another. In most Haitian churches only the minister may be fortunate to own a car. In some others, even the minister might not have a vehicle which means their ministry greatly suffers. For several years, I Profaite Medeus, the senior minister of Cities Christian Church (commonly known as the Cite Soleil Church), struggled with my car because it was broken from time to time and this required that I spend a great deal of money and time to fix it. 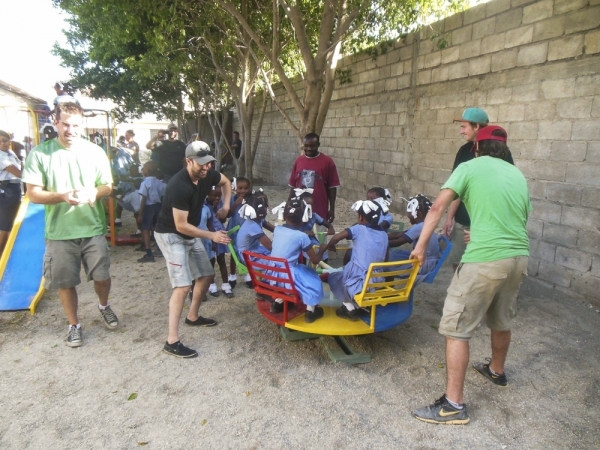 Besides serving the church, I also help Mission Communautaire de l’Eglise Chrétienne des Cités (MICECC),[(Community Mission of Cities Christian Church], the only partner of Haiti Outreach Ministries (HOM) in Haiti, in several fields such as finances, feeding program and the vocational school. Having a reliable vehicle is a must for me to efficiently fulfill my ministry. God has answered my prayer. I have a new car, which is a diesel Toyota Pickup. Praise the Lord! I wholeheartly present my highest gratitude to all my donors who contributed to buy this vehicle. A thousand thanks to all of you! It is my prayer and my wish that God makes a way for my colleagues Pastors Luc Aristhene and other pastors who are still coping with transportation problems. On Thursday, August 24, Nadege Gay, daughter of Pastor Leon and Jacky Dorleans, moved into her new home in Winston-Salem where she will be living for the next two years as she finishes her bachelor’s degree. Nadege received a warm welcome upon her arrival and is very excited about completing her college education at Salem College! Nadege has unpacked the things she brought from Haiti, received her student I.D., met with her college advisor, and picked up her textbooks. She has been to Orientation and started classes on August 28. She has begun her life as a college student! While she is attending Salem College,Nadege will be living at Salem Academy, a high school for young women, and serving as a House Counselor. In exchange for her work at the Academy, Nadege will receive room and board. Due to the proximity of Salem Academy to Salem College, Nadege will be able to walk to her classes. Nadege will be attending First Presbyterian Church during her time in Winston-Salem and hopes to teach Sunday school. Church members have been instrumental in helping her transition to her new home and will continue to assist her during her time at Salem. We are grateful to all those who have contributed financially and in numerous other ways to make it possible for Nadege to attend Salem College! Due to the overwhelming generosity of churches and individuals, Nadege will have the funds to cover the expenses to finish her college education! Prayers have been answered! We are confident the Lord will watch over Nadege as she pursues her degree in her new home in Winston-Salem. Thank you for your support and for keeping Nadege in your prayers. 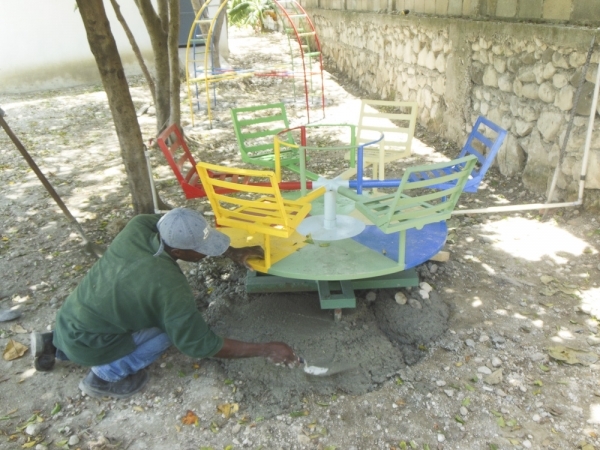 We wanted to share with our supporters a number of changes at Haiti Outreach Ministries (HOM) that have taken place this summer. Bill Glass announced his resignation in July after serving as President for the past six plus years. We are grateful to Bill for his service and leadership, especially after the earthquake. His wife, Linda Glass, who was the Sponsorship Director, has also resigned. We appreciate her 14 years of service in an important area for HOM which has grown immensely. Both Bill and Linda have graciously stayed on to assist as needed during the transition. Bill will be succeeded by Chris Northup, who was elected by the Board as President and assumed the office in mid-July. 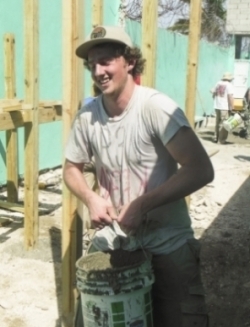 He has had many years of experience volunteering in Haiti and working with the ministry supported by HOM. Susan Weber, who currently oversees the primary student sponsorship program, has agreed to take on the role of the Sponsorship Director. Supporters will also note a new HOM mailing address on the About Us section of the website, which is the mailing address used in the past for checks. HOM is consolidating all mailing addresses to simplify correspondence with sponsors and supporters. The Repatriote Church roof is expected to be completed in September. There is additional work and funding needed to finish the interior but we plan to worship in the new space beginning in September. The Repatriote second classroom building is well along and should be ready for expanded classes in September. 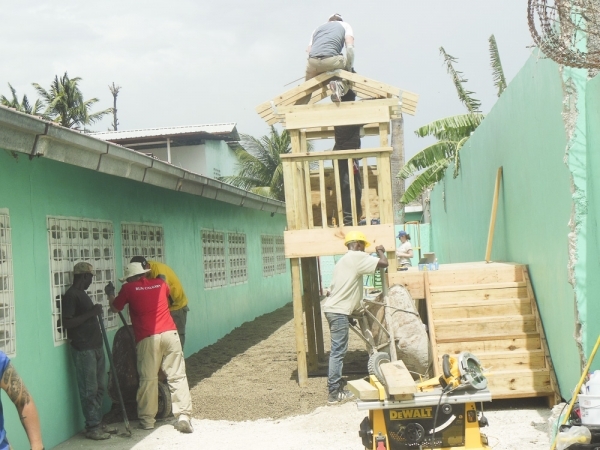 The second floor of the Cite Soleil Clinic, which will be the site of an expanded vocational school, is nearing completion and should be ready for fall classes. The expansion was needed to accommodate outgrowing the existing space, originally located in a single room behind the soccer field. Dental clinic construction, also housed on the second floor of the Cite Soleil Clinic, is nearing completion and depending on funding, should be ready by the end of the year. The new secondary school (high school) compound has the wall completed, and work on the foundation of the first building is expected to begin in September. Funding has been provided and a contractor has been selected to rebuild the Ibo Beach Church roof, which was lost to a hurricane last year. 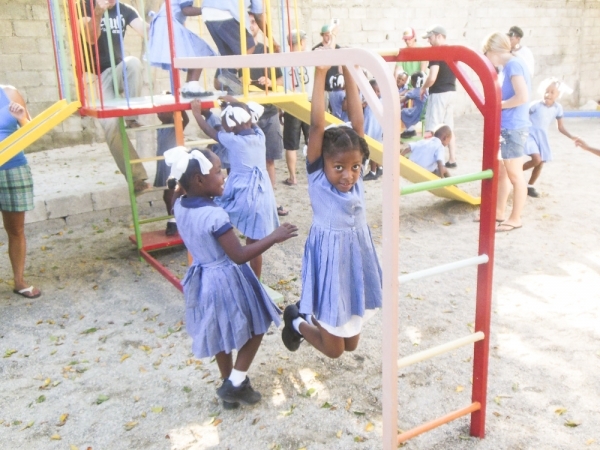 The first ever children’s playgrounds have been constructed at Blanchard, Cite Soleil and Repatriote and are ready for use as fall classes begin. A beautiful youth soccer field has been completed at Repatriote and trees planted around the field for shade. Nadege Gay, Leon and Jacky’s daughter, who has been in charge of the Blanchard school, will be starting at Salem College in North Carolina later this month. She will be working towards a Bachelor’s Degree in Business and School Administration and will be attending for two years. You’ll be hearing more about these various projects and activities in the coming months, so please stay tuned here and on Facebook! As always we ask you to pray for the students, teachers, volunteer staff and the pastoral staff that we may continue to serve God in many different ways. 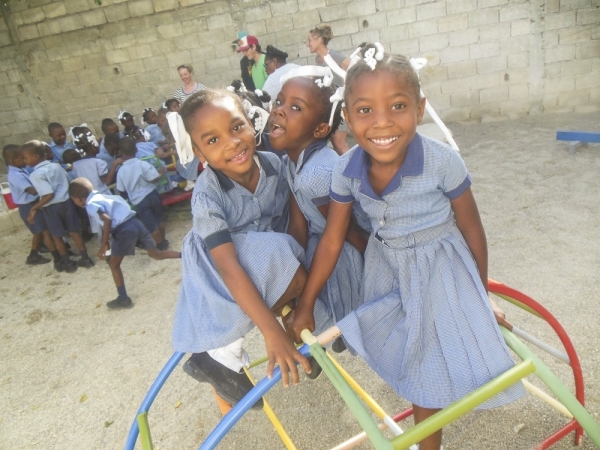 We appreciate the support of all who have sponsored children, come to Haiti and provide resources for the work being done in Haiti. Back in October of 2012, a longtime friend and supporter of HOM wanted to pursue a partnership between HOM and the company he works for, Long View Systems in Alberta, Canada. Long View Systems has a policy to encourage their employees to give back in their communities and beyond. 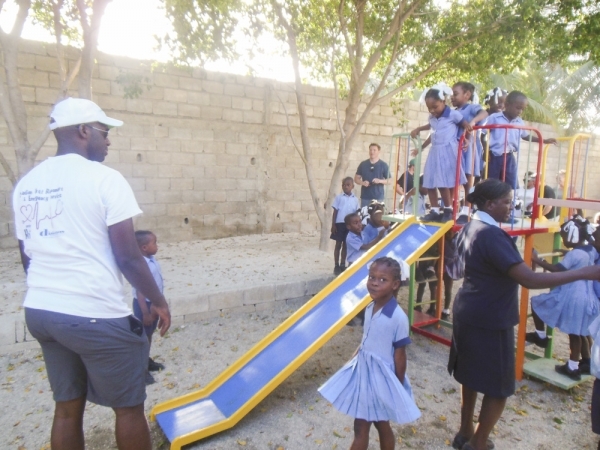 Through their “Long View Cares” program, the employees raised over $18,000 to be used for three playgrounds for the students at Cite Soleil and Terre Noire (Blanchard). The giving back didn’t stop there. 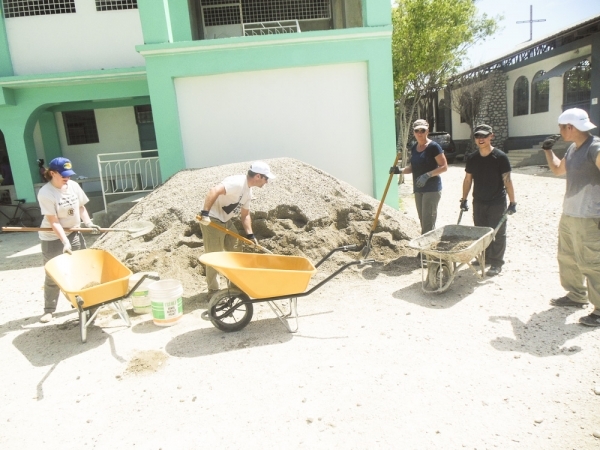 Last week (May 25-31, 2013), Long View Systems sent a team of 18 to Haiti to install the equipment themselves! In addition to the playground equipment, they added a wooden play fort/castle along with an adjacent tricycle riding path that meanders through the play area. 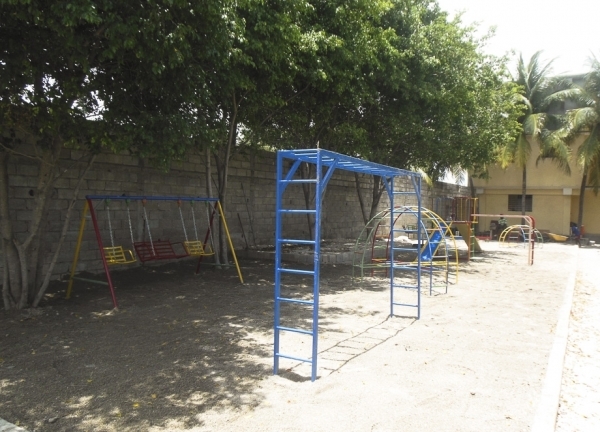 The playground equipment was made with quality materials and it was important to the team that the installation was completed in the best possible manner. This meant that another $5000 was needed to complete the project. Long View raised another $3150 while they were in Haiti. Ridgecrest Baptist Church in Durham, NC generously gave $2000 once they heard about the need. We are grateful to everyone at Long View Systems and Ridgecrest Baptist for their commitment to reaching out and giving back. 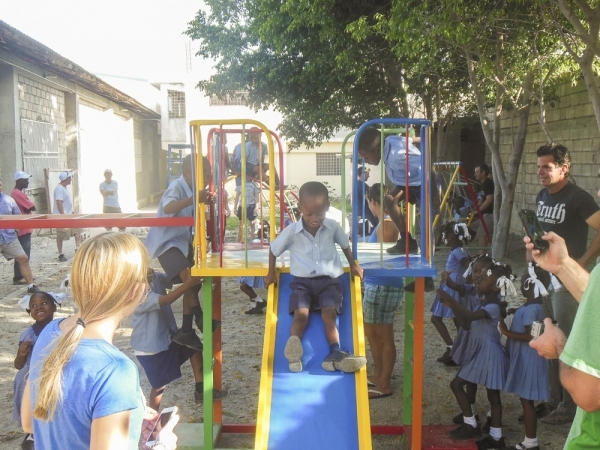 While putting up playground equipment on school grounds in a Third World country may seem a bit odd to some, having a safe place for children to be children is a win-win situation no matter what country you live in. The physical and emotional benefits are numerous. The pictures of happy children below really say it all. Each year HOM churches have a month-long emphasis on the family. This year, the churches have decided to do this throughout the months of May and June. All sermons, Bible studies and Sunday school lessons are centered on family issues and are educational. Special speakers are planned and family health training sessions. The month-long focus on the family is now something that the other churches also participate in as well, however this year the leadership made the decision to extend throughout two months. Kicking off this special time will be a Youth Cultural Fair on May 1st. Some other events planned are a celebration of all couples married 25 years or more, youth beach day, concerts, and new deacon installation. We would like to encourage you to join in this family emphasis through prayer. Whether in Haiti, the U.S., or wherever you may be, families are in danger. Pray for families to be strong and stand firm on God’s Holy Word. Let the next two months be a “revival” of the family and let us all join together to focus on the family. See photos here! Check back often, as we will add new ones throughout May and June. We are pleased to announce that Pastor Profaite Medeus will be receiving his Doctor of Ministry degree on May 4, 2013. We are proud of Profaite and his hard work, not just in receiving this degree, but in all his work with HOM. We are blessed to have him as a significant part of this ministry. For those of you who would like to send a note of congratulations, you can send him an email directly: pmedeus@haitioutreachministries.org. If you would like to honor Profaite by a gift of support, we have a fund established to assist him in getting a new truck. As you may be aware, Profaite has been in critical need of a reliable vehicle. If you would like to make a donation, click here. See photos from the graduation! HOM would like to make our supporters aware of an incident that took place at Repatriote. In the early morning hours on Sunday, April 7th, a group of young men climbed over the security wall of our mission site in an effort to vandalize and rob the property. The caretaker (who lives on the property) was able to quickly contact church and community leaders by phone. The members of the community responded by rallying outside the walls and when the young men realized what was happening, they climbed back over the wall to escape. HOM regrets to report that one of the young men who broke into the compound has died in the incident. Our colleagues in Haiti are continuing to deal with the aftermath of the situation. HOM does not feel this jeopardizes the safety of any mission teams traveling to work with our supported projects. Daily construction on the compound has not been affected. We ask that you join us in praying for this community and the individuals involved. Thank you for your prayers regarding this situation. We recognize that this was an isolated incident, however are still saddened by the events that occurred. Any legal issues regarding this incident have been resolved, and no fault has been found with the local ministry and its ministry partners. We are honored and humbled by the support of the Repatriote community and their strong faith in God during this time. This experience has by no means been comfortable for me. Cold showers, peanut butter lunches almost every day, and being so far from the comfort of an American lifestyle all combine to make anyone a little uncomfortable. But coming to work for HOM was never intended to be a comfortable experience. Life changing? Definitely. Comfortable? Not so much. In the 3 months I’ve served with HOM, I’ve seen first hand how much the Haitian people have to offer. While financially they have so little, emotionally and spiritually they have more than I could have ever imagined. While I’ve seen the devastation of earthquake damage and waste in the streets, I’ve also been blessed to experience the beauty of the beaches, mountains, and smiling people around me. Not only have I been blessed by the Haitian people around me, but I’ve learned so much from the other American long term volunteers. Matt Woosley is able to put a positive spin on even the most frustrating experience. Marty Welp is one of the most giving men of God I’ve ever been around… not to mention hilarious! Jessi Stitt is so much fun and was able to ward off my homesickness like no one else could. And last, but certainly not least, Patty Villalobos was a great roommate and was always there to listen and encourage me. My heart has been forever changed by this experience and these beautiful people. I can’t wait to come back and bring more people with me! Have you heard the saying, “How can you see this and not believe in God?” This is what I say every single day I am in Haiti. The beauty that surrounds me here is one that can’t be described by words. It is something that can only be felt by the heart. And Haiti has captured mine. 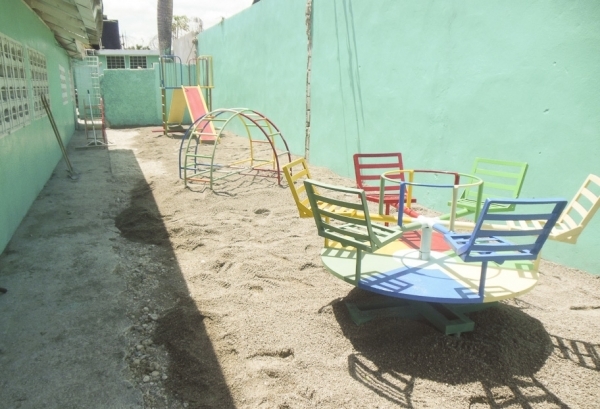 At first glance, Haiti is seen as a broken nation with no hope of recovery. But as I spent more time here and formed relationships with the smiling people of Haiti, I have learned to see the country through the eyes of the people. This place is no longer a broken nation, but a nation of broken people with so much hope in their eyes. I came here to serve the people of Haiti, but quickly found out that it’s not about that at all. Haitians have the one thing that can make their hunger go away, their pains go away, and their financial troubles go away. It’s the love of Christ. I see how they have struggled, and I thank God that He has put an incredible willingness in them to live their lives despite their circumstances. They are descendants of slaves who formed a nation of their own. There will always be new hope every single day. Haiti has blessed me far more than I can ever imagine. The family I have made here is one overflowing with love. The friendships I have made are better than any I can ever imagine. Growing up, I didn’t experience much love or friendship, but in Haiti I feel love all around me every day. Even something as simple as a “bonswa” has changed my life forever. I have found that I can’t help but love everyone here. I have been welcomed with open arms and all I want to do share that same love back. I take back with me something that is vital in life. I take back the willingness to love and be loved. Living in Haiti is a different experience for everyone, but for me it has been a journey of hope and how to love. I will forever be changed and will always remember the smiling faces of the people of Haiti. Although I don’t know what the future holds when I get back to America, I know that I have a home in this beautiful country. 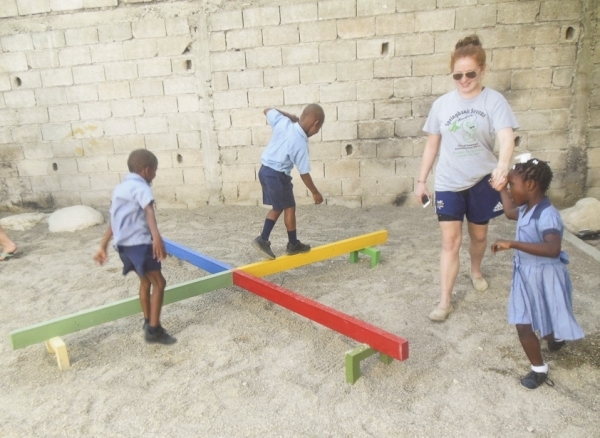 And like I said earlier, Haiti has captured my heart. 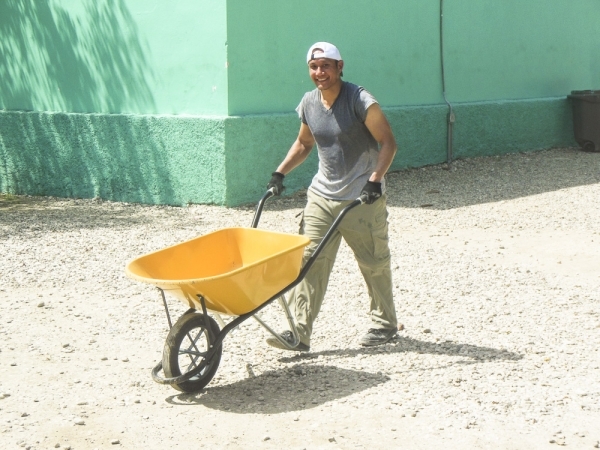 Since the earthquake in January 2010, HOM has been very blessed by those willing to serve on long term mission trips. 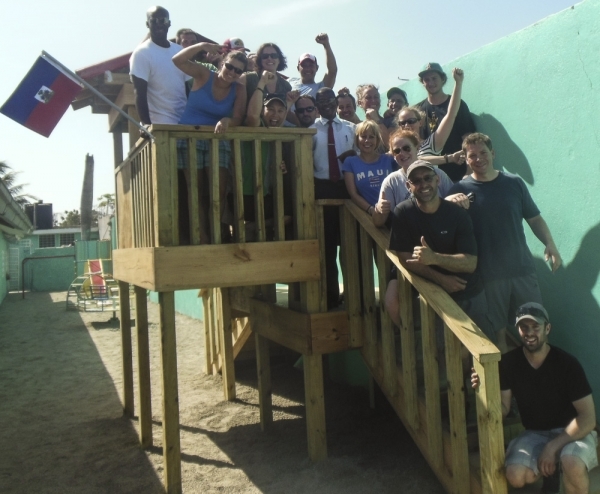 What began as sending those willing to go in the midst of the devastation and coming alongside those grieving to rebuild and restore their lives, has become a beautiful picture of the family of God for both the Haitians and Americans serving together. As you can see by the testimonies of these two young ladies, what they received from God was beyond what they could have imagined. Katie returned home last week, and Patty will be leaving us in less than two weeks. These are two of many who have chosen to step out on faith. We are grateful for those who have given of themselves in the past, those serving now, and those yet to be called. For more information about long term volunteering with us, please click here. Living in a Third World country brings its share of challenges, one in particular the rest of us seem to take for granted: access to clean water. It’s hard to understand that world-wide that there are communities that exist without ready access to drinkable water. March 22 has been set aside as a day to recognize the importance of accessible clean, fresh water. HOM believes that this is critical to the health and welfare of our Haitian friends. In 2008, three couples from Palms Presbyterian Church in Florida attended a “Clean Water U” course taught by Living Waters for the World (www.livingwatersfortheworld.org). After completing the program, these couples who were already involved with HOM traveled to Haiti to conduct water testing on our four mission sites. The results of the tests found that the city water used by Cite Soleil was the worst of the batch, full of bacteria and certainly not suitable for drinking. 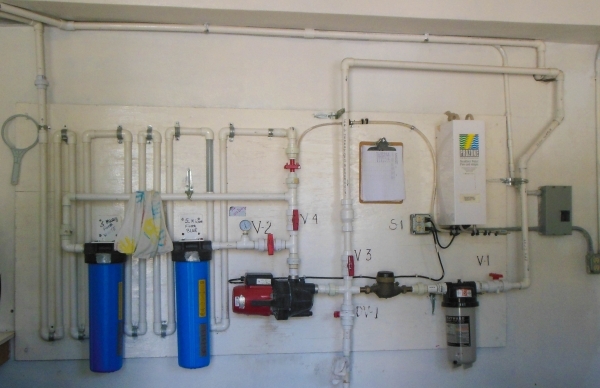 The first clean water treatment system was installed in an old unused kitchen facility at Cite Soleil. This system was severely damaged by the 2010 earthquake. The Palms water team re-installed the system in June, 2010. It has since been relocated by our Haitian operator, Tho, to a permanent location in the new clinic building. The Palms water team continues oversight and maintenance on the system. In 2011, First Presbyterian Church of Pascagoula volunteered to install a clean water system at Terre Noire (Blanchard). The Coordinator for the Cite Soleil project worked with First Pres. to install an identical system. Having identical systems was important for any future maintenance and repair parts, as they would be the same. Both the Palms Pres. and First Pres. teams have indicated that they are ready to install additional systems on the Repatriote site and when the High School is built. At both the Cite Soleil and Terre Noire locations, families are able to receive five gallons per day. HOM’s current expenditures to maintain these systems is about $10,000 per year. Currently the well that had been dug on the Repatriote site has been a tremendous blessing, as to date it has provided clean, drinkable water for families in that community. In observance of World Water Day – we would like to encourage you to take a week-long water challenge with us: drink only water. Next Friday, which is Good Friday, consider making a donation of the money you saved towards our water filtration program in honor of Christ, the source of Living Water. To donate, write “water” in the “other category” field.